Soft gaskets can be made from a diverse range of materials: oil resistant paper, cellulose or aramid fibre reinforced paper, as well as cork and rubber. 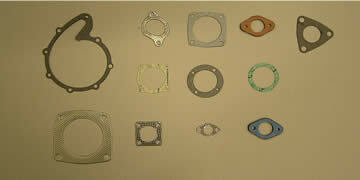 These gaskets provide seals for fuel, coolant and oil applications. Careful material selection is key to ensuring that the appropriate material is used to suit the fluid being sealed, the application temperature and load pattern. Typical applications can include oil pumps, water pumps, valve covers, sumps, intake manifolds and turbo oil feed/drains. If you have a requirement for soft gaskets, please contact us to discuss how we can help.